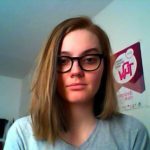 Alternative Urbanisation Working Group (AU WG) of CDN gathers young people interested in exploring, discussing and learning about alternatives to current urban practices in the Central and Eastern Europe. It was established in 2013 after an event on democratic participation of young people in their cities. Since then, the WG has organised online movie discussions and calls for articles. In 2016, the WG conducted the study session “Reclaim the city” on topic of youth participation in creating inclusive and sustainable cities, in European Youth Center in Budapest. In 2018, WG successfully implemented one year long project “Urban Steps for Resilient Future”, consisting of an international training of trainers, four regional trainings, and 11 local actions implemented by young activists in 10 different countries. Today, majority of the world’s population lives in urban areas and the number is only expected to increase in future. 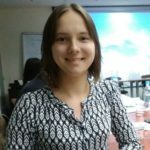 With this project we want to empower youth to discuss and cooperate in the development of the alternatives to current manners of urbanisation in Central and Eastern European cities. We see the current urbanisation in our cities characterised by a low amount of governmental regulations, lack of public, especially young people’s, opinion consideration in planning and shaping the cities, lack of tools for political participation for youth or will from the political stakeholders to foster it. These are followed by socially and environmentally unsustainable practices – gentrification, suburbanisation, exclusion, injustice, pollution and lack of space for the young people to socialise. We would like to adress these issues, as we consider cities the best platform for local, community-lead change to take place. 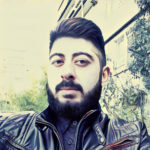 We believe that this project will contribute to defining and popularising the AlterUrb concept as a very practical and recognized element of progressive youth politics as it is rooted in principles of inclusion, participation, social and environmental justice and empowers the youth to take action on community level. Alternative Urbanisation is based on values of human dignity, freedom, democracy, equality and respect for human rights. We are convinced that we need more pluralism, non-discrimination, tolerance, justice, solidarity and equality. Considering the above mentioned, with this summer school we aim to conceptualise and promote the model of sustainable and democratic cities among active young people in the Central and Eastern Europe and provide them with tools for reclaiming their cities. To create a toolkit of positive practices and methods of influencing politics on a very local level. The program will be based on the principles of non-formal education and intercultural learning. We strive for active, inclusive and direct communication, as well as transfer and sharing of knowledge. Sessions will be balanced between theoretical inputs, training, workshops, discussions, reflection, planning, brainstorming and other interactive methods of learning. 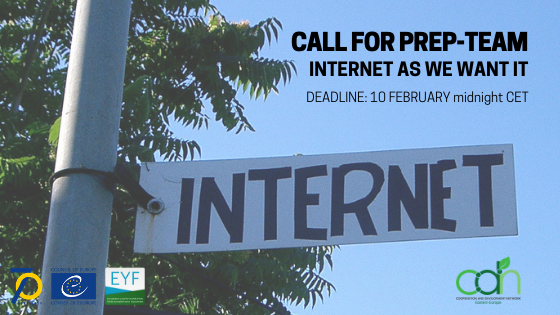 We are looking for young people who are passionate exploring the connection between digital rights and online journalism, and the values of the Green movement. 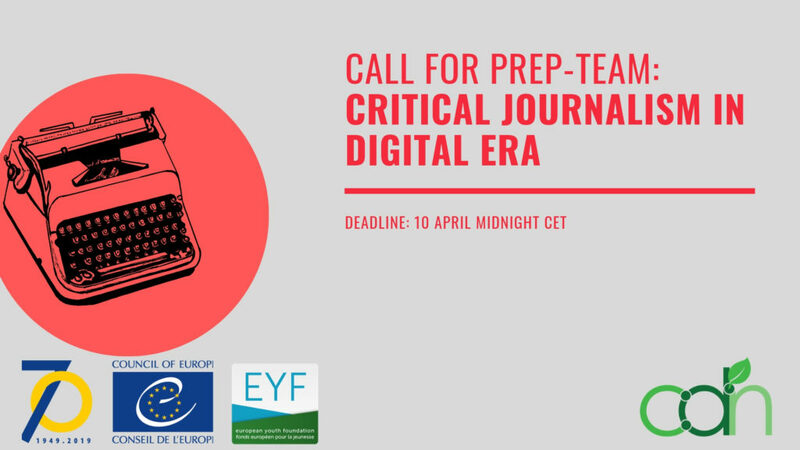 Are you motivated to turn online journalism into a more proactive one? Then this is the right activity for you! Speak English (you should be able to clearly express yourself both orally and in writing). Be familiar with non-formal education methods. Accommodation, food, working space, travel and visa costs for preparatory team will be fully covered. For selection of travel means the condition is to combine the most economic and environmentally friendly way (lowest price + travel time + CO2 emissions). 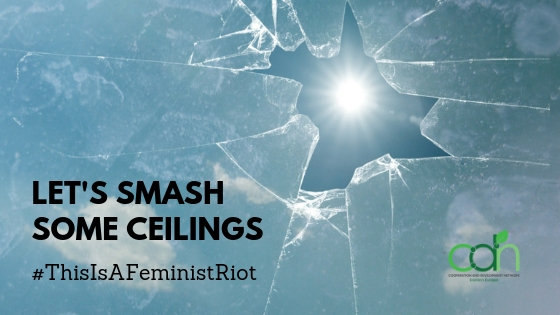 Cooperation and Development Network is very happy to announce its new publication “Smash Ceilings: Handbook for Brave Feminists” and its very first podcast “The Glass Ceiling Is Not Your Limit”. 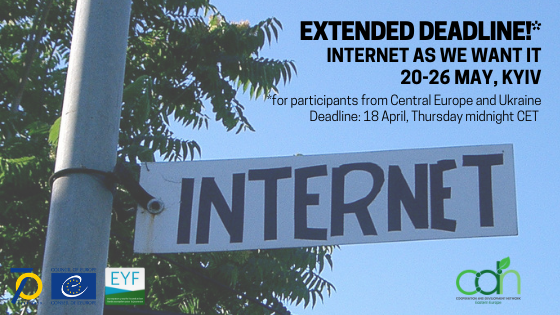 Cooperation and Development Network Eastern Europe and its Digital [X] Working Group are announcing a call for members of the preparation team of the international seminar “Internet as we know it vs Internet as we want it”. The seminar will take place from 20th to 26th May in Ukraine. 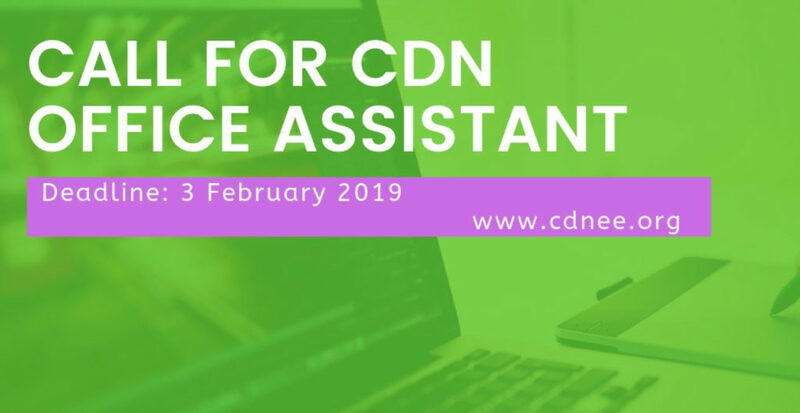 DEADLINE for submitting online applications:10 February 2019, Sunday at midnight (CET). We are very excited to let you know that we secured funding that will allow us to support the new office assistant’s work and residence permit in Serbia. Moreover, we open this position for full-time and wait for your applications until 17 February, Sunday at midnight CET. participants coming from Bosnia, Montenegro, Macedonia, and Serbia. festival of discussions, movies screenings, workshops and direct actions. 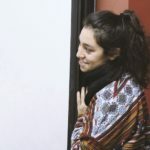 The EkoFest 2018 will be organized in cooperation with CDN and will focus on the topics of food production, and will approach the food production from different angles: from food processing and distribution to consumerist habits and veganism as a political statement in the frame of sustainable living. This years’ program will include public events and closed activities for more than 40 registered young Green-minded activists. Public program will include panel discussion, movie screenings and lectures, while closed part will include study visits and workshops. 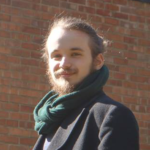 interested in Green Politics and activism in general. • Participation is free of charge. Working language of the Festival will be Serbian with the possibility of English translations. Here you can find the registration form. The deadline to fill in the form is: 9th of December.